The coffee shop was simple and cozy: a long glass counter, polished to perfection, where cakes, scones, eggs, bacon and beans were neatly arranged. In front of the counter, facing the bright wide windows, tiny white tables for two people. Outside of that little café there was Ireland, the boundless meadows of the Kilkenny Castle, bus as the only means of transport and the curiosity of a continuous discovery. That was my second time in Ireland, a week in August for the university summer break, a breath of fresh air between the exams of advertising and semiotics. I was travelling with my friend Laura, companion of many road trips. We decided to have breakfast in that coffee shop, curious to see how would feel to eat as a local. I still remember how it was called: three item special. An inviting name, though we probably misunderstood the real meaning of special at the moment. With the help of a not too trained English we ended up ordering two three item specials and three other additional dishes from the menu selection. We sat slightly intimidated at the table and we waited. Soon after two waitresses came out from behind the counter and began to bring our breakfast. Beans with tomato, scrambled eggs, crispy bacon, toasts, butter and jam. Then a moment of embarrassment: we run out of space on our table. They looked at each other, then they took a look around and decided to move a table and add it to ours to have extra space. And they kept on bringing the smoked ham, cakes and scones with jam. We not hold back laughter, while the other regulars of the small coffee shop in Kilkenny looked at those two naive tourists with a mixture of disbelief and tenderness. Needless to say, the breakfast came out of the cafeteria with us well hidden in backpacks in the form of snacks and sandwiches for lunch. Too abundant, too far from our habits, but perhaps for that very reason so indelible in my memory. As you might have heard, the Italian breakfast is quite another thing. First of all, in most cases – except for individual preferences – breakfast is sweet and not salty, and then it often verges on the routine and monotony. I know people whose names I won’t make now – mum – that have been eating the same breakfast for thirty years: scalding caffellatte with three fette biscottate at dawn every day. Every day. Also for Christmas, even for her birthday, in winter and summer, that’s her breakfast. We felt it was the right time, after a year of Italian Table Talk – already a year! – to cover the topic of breakfast and tell you about our preferences, our rituals and our memories related to the first meal of the day, which according to experts – and according to my mum – is also the most important one. Valeria wakes us up with the raisin buns of her childhood, Emiko has instead baked a tray of little cherry tarts which can put a smile on the face of the most surly person, while Jasmine made a classic cake perfect in its simplicity, the torta margherita. I am presenting today an classic of the breakfast at the bar, the Italian croissants known as cornetti. If you follow me on Instagram (do you follow me on Instagram? nooo? You can find me as JulsKitchen if you ask) you may have noticed that I like to vary the breakfast, from crepes to bread pudding cake, from yogurt with fresh fruit and cereals to rice pudding. I do not have a tradition and I’m very careful not to fall into the routine: I enjoy changing, as far as possible, to wake up with a bit of curiosity. It is a different matter when it comes to breakfast at the bar. Having breakfast in a bar in Italy can be stressful if you’re not used to it and you suffer from the usual performance anxiety that hits you in the most important public occasions. At first comes the choice of the sweet pastry you are going to eat or dip in your cappuccino: I usually come closer to the counter and I start pointing out the various croissants. Which kind of croissant is that? apricot jam. That one? wholemeal and honey. That over there? chocolate. There instead? custard and apple. Then I understand by the impatient tone of the waitress that I have asked too many questions, so I begin by saying with little certainty: then I’ll take a croissant with… moment of reflection during which I mentally try all the combinations… nothing inside. Is there a plain croissant? And I grab with an apologetic smile the delicate croissant, often still warm, that the waitress hands me wrapped in a paper towel. Then it comes the time to order coffee. Usually in the bar at breakfast time there is a large crowding all around the coffee counter: the usual, macchiato, ristretto, corto, a cappuccino, a latte macchiato, a long coffee. Wall Street at end of the day is much more quiet than a bar at breakfast. Requests are made in a tone that ranges from brisk to pleading, this being me when trying for the fourth time to order a coffee and someone else next to me gets his order before me. Then, with your coffee in the balance in one hand and the croissant – the empty croissant – in the other, you move towards a table if you’re lucky, or you press yourself in a corner of the counter to finally enjoy your breakfast. It is probably clear that I prefer to have breakfast at home, with all the calm of the world, without having to fight for my coffee. Though the still warm croissants have more than a reason to be appreciated, especially if you are lucky enough to find those made as they should be made, with good butter. Making them at home takes time and patience, especially in flaking, but every once in awhile I assure you it is worth a try. 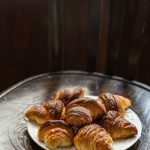 I learnt the following recipe during my pastry course last year, I cut down the ingredients to have a normal amount of croissants – 40 cornetti are perhaps too many also for me – and simplified the procedure in order to make them easily at home. The result is the cornetto you might order at the bar, with its shiny surface, not too sweet nor too buttery. Unlike the French croissant, the Italian cornetto has more sugar and has also eggs and orange peel that are absent in the croissants, thus resulting … well technically heavier, but the orange hint will hide the amount of butter still present and most importantly the egg gives a pale yellow colour which helps to add a bit of happiness to the morning. Ready to dust with flour your hands and nose? Add the strong flour, the all purpose flour and salt in the bowl of a stand mixer. Dissolve the yeast in warm milk and add it into the flour, then add the water and the lightly beaten egg. Knead at medium speed for about ten minutes with the hook attachment. Add the butter at room temperature and the sugar mixed with the seeds of the vanilla bean and the grated zest of an orange. Knead for ten minutes with the hook attachment. Remove the dough from the bowl and put it in a plastic bag that has enough space to let it rise and store in the refrigerator for 24 hours. Prepare the butter, so the day after you will have all the ingredients ready. Use the butter at room temperature and with the help of a rolling pin spread it between two sheets of baking paper in a square sheet, as regular as possible. Store in the fridge. The next day, remove the dough from the fridge and turn it on a well-floured work surface. Roll it with a rolling pin on a disk slightly larger than the butter sheet. Place the butter in the centre of the dough and gently pull the four sides of the dough over the butter, to close it inside as in an envelope. With the help of the rolling pin and other flour stretch the dough so that it could triple its length but maintain the same width. Make a three-fold: mentally divide up the dough into three equal parts and fold on the middle part the right side, then the left one. Seal all the edges by pinching the dough together. Rotate the dough 90 degrees and roll out again in a rectangle sheet so that it quadruples its length. Now is the time to give a four-fold: mentally divide up the dough into four equal parts and fold the two outer parts on the two inside. Fold again to close as a book. Wrap the dough in plastic wrap and let it rest in the fridge for an hour. After this time, remove the dough from the refrigerator and roll it into a sheet of 5 mm thickness. With a sharp knife or a pizza wheel cut out strips, then long and narrow triangles. Each triangle should weigh about 50 g.
Make a small incision of 1 cm on the short side of the triangle and wrap the triangles on themselves from the short side. Fold the sides of the croissant just formed toward the center, to give a crescent shape, and put the tip of the triangle under the croissant so that it won't open while rising. Arrange the croissants in a tray lined with baking paper and let them rise in a warm place for 2 hours or until they have doubled their volume. When they are ready heat the oven to 200°C. Bake the croissants for about 15 minutes, until golden brown. In the meantime heat the apricot jelly in the microwave or in a bain-marie with a tablespoon of water. As soon as the croissants are out of the oven brush them with the apricot jelly. Enjoy your breakfast! The hashtag to follow the conversation on Italian Table talk on Twitter is #ITabletalk (easy, isn’t it?). We are curious to hear which is your favourite breakfast and how you deal with routine! Beautiful croissants! They look perfect. The best breakfast item ever. Oh Giulia, I love love love the story of your Irish breakfast! SO different to colazione all’Italiana! I must have those anglo saxon breakfast genes in me as I can never get by with a pastry and coffee for breakfast, but I wouldn’t be able to walk past home baked cornetti – what a TREAT! Lovely post – I do love a huge hotel breakfast on holidays. Your croissants though look the perfect thing to bring a feeling of special to a home cooked weekend version! Giulia, thank you soooo much for this! I have several times improvised cornetti by altering a croissant recipe. We call them faux cornetti. They are good but not the cornetti of my memories and dreams. My family amd I far prefer cornetti to croissants ( our children each fondlynremember the time when i let each of them go to the bar by themselves to retrieve our breakfast when we were living in Rome and Siena. I will be joyfully donning my apron and trying my hand at these as soon as possible 🙂 thanks again!!!! Cornetti are the only thing I eat for breakfast when I am in Italy. My favorites are the apricot or cherry jam-filled ones paired with a cappuccino. These are on my (very long) list of things to learn how to make. Beautiful post as always! But more importantly, I want to make those gorgeous, awesome croissants! Like NOW! LOL LOL that was embarrassing. It reminded me of this time I was in China for work and a similar situation happened with me and a friend. I never made croissants at home, but I think I will soon! Your croissants are absolutely gorgeous! I have always wanted to make cornetti! Thank you for the recipe! I did find it strange when last year I visited my relatives in Italy many times breakfast was a “long-life” pastry and yet lunch and dinner were a feast of home made YUM! Though one cousin produce a delicious yoghurt cake! My daughter is through and through Italian – an espresso and a sweet cake. I loved reading you experience in Ireland. I made them last week and can’t wait to bake them again!!!! I have tried with other recipes, but these are the best by far!!!! Many thanks for sharing! thank you so much for the feedback Micaela! I am also in love with this recipe! many many many more baking happiness to you! Beautiful – but please excuse my ignorance when I ask: what is strong flour? Hey Marbrill, strong flour, in Italy, is ‘OO’ flour – double zero. I cannot thank you enough for this recipe! I knew when I read it that it was perfect, and my husband and I were longing for our Italian breakfast. Turned out beautifully, and I’m sure I will be making these regularly. Gracie mille! Darned autocorrect. Grazie, not gracie. Hi! I have been looking for a Cornetti recipe ever since I returned from Italy. My mornings just have not been the same without them! I was wondering if it’s possible to get the full recipe for 40 cornetti? I’d love to make a big batch for my family and friends. Hi Palma, you can easily scale up the recipe, adding 4 times the quantity of every ingredient. 🙂 it’s a good idea to bake a big batch of them! Ciao Giulia! I am Italian and I love to bake and cook and do the things my mamma was passionate about. I’m living in the states and I’ve recently started a blog capturing moments with my parents and posting recipes that I love — Italian and otherwise. I’ve been looking for a cornetti recipe and your blog popped up!! How lucky is that!! I am signing on to your blog so — alla prossima! Ah, I could kiss you for this! LOL I’ve been looking for years for a decent cornetto recipe! I final resorted to simply baking “baker’s (yeasted) croissants” – and they are so not the same! With my youngest’s impending return from Rome, I wanted to surprise her with cornetti al cioccolato, and now I can. Many thanks! In theory you can, but I can not guarantee the same result! go for the fridge for the first time! I’d love to make these croissants but I cannot get fresh Brewer’s yeast in my area. Can I use dry yeast, and if I can, would the measurements be different? Thank you! I made these for my boyfriend who is from Milan but is studying abroad here in the U.S. They came out perfectly, and they cured his homesickness for a little while. I’ve tried several other of your recipes to equal success! For anyone wondering, I used normal bread yeast as that was all I had available, and they came out just fine. Thank you for sharing!!! This makes me so happy! and thank you for your feedback on bread yeast! Hey all! You can order Brewers yeast off of Amazon! My girlfriend and I made these croissants this past weekend and they turned out amazing! The inspiration to make these came from a recent trip to Italy/Switzerland where we enjoyed croissants, espresso, and fresh fruit just about every morning for the 10 or so days we were there. We (mostly me) wanted a way to bring that experience/memory back to the States so I did some intense Google searching for a recipe that would be good and stumbled upon this one. After about three months, we finally set aside some time to make these and they turned out better than expected as this was our first time ever attempting to make croissants. We substituted Brewer’s yeast for active dry (that was all we had at the time) and it did not seem to mess with the recipe at all from what we could tell. Definitely keeping this recipe in my collection! Hello Brandon, food memories are the best kind of memories, and I am so happy you managed to replicate a part of you trip back home! I just returned to the USA from southern Italy (my 3rd time this year) A few times a week we head down to the local bar and get a cappuccino and fresh baked cornetti. and I a sure you I have tried every kind they make. I have been unable to find them here in our area of the US and we have a large Italian community. I found your recipe and I can not wait to make them. Thank you! I am so happy that my recipe is a way t ravel back in time to your holidays in Italy! Let me know the results!